Corporate Social Responsibility is an integral part of Gati’s business model and we are committed to fulfilling our responsibilities as a member of the society. We as a group continue to contribute towards the field of education, skill development, environment and disaster management during natural calamities. Our key initiatives have been providing assistance in constructing schools, helping natural disaster victims in sustaining their occupation and supporting the cause of green environment. 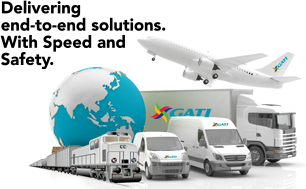 Gati also contributes in various ways for maintaining the environmental sustainability. Gati’s CSR vision : We envision a community of responsible and educated citizens who are environmentally conscious, practice social responsibility in their daily lives and inspire others to do the same. We commit to operating in an economically, socially and environmentally responsible manner whilst balancing the interests of diverse stakeholders. Education: Adoption of Govt Schools which encompass infrastructure development, providing tools for enhanced learning, aiding in providing a hygienic learning environment along with a focus on activities that foster overall physical and mental wellbeing. Community: Gati organises multiple welfare events to reach out to those less privileged in the community. The organisation strongly believes in creating awareness about healthcare and enabling sustainability within the community we live in. Environment: Gati believes that the environment be used in a way that is sustainable. The company ensures that the use of natural resources will meet the present day needs for the resource without jeopardising the supply of the resource for future generations. Rural Development Projects & Donations: Rural development is a dynamic process and Gati’s contributions include putting up of economic & social infrastructure, medical research to improve rural health and skill development initiatives. Gati partnered with the Government of Andhra Pradesh and built a school building with 27 classrooms, washrooms and a large playground. 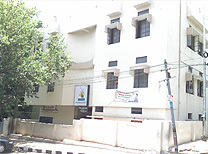 The school which currently provides education to more than 850 students was declared a “Model Government School” in the year 2011. Gati financially supports the school in conducting yearly events (Republic Day, Independence Day, Teachers Day & Children’s Day) and undertakes all expenses related to house-keeping, security and maintenance. A computer lab is inaugurated with 20 computers and computer knowledge imparted from Class III to IX by a dedicated computer instructor. Every year the P.D.Agarwal Meritorious Student Award is awarded to the Toppers in Class VIII & IX. Sports development to the students is very important activity undertaken by GATI and sponsors the Handball team with sports kit and nutrition supplement. 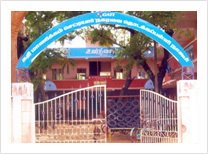 Gati undertook the development of the MC High School at Nagore, which was a tsunami affected district in Tamil Nadu and constructed a building with 18 rooms, a kitchen and toilets. Currently the school provides education to more than 500 children from the Tsunami affected families. 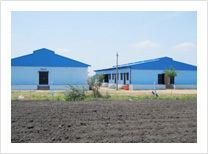 The School was recently awarded the ‘Best Government School’ in the Nagore area. Gati financially supports the school in conducting yearly events (Republic Day, Independence Day, Teachers Day & Children’s Day) and undertakes all expenses related to house-keeping, security and maintenance. A computer lab is inaugurated with 20 computers and computer knowledge imparted from Class III to IX by a dedicated computer instructor. (NSTR ). 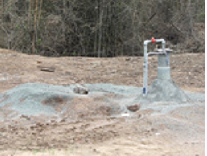 The pump with the help of solar energy pushes up water to an overhead tank installed on a 10-ft high tower. Its one of the unique example of installation of innovative, clean and renewable energy system in water-scarce areas of reserve forests but of NGO- corporates collaboration for good practices in management of critical wildlife habitat areas. Ground water is receding rapidly. If we continue this exploitation we will be without water very soon. Ponds can be the lifeline of both villages and towns. Under this initiative 2 large areas were identified for digging of ponds to recharge the ground water. The Tagore Society for Rural Development (TSRD) has been running six projects in the state of West Bengal to create awareness among the Sunderban communities. To help the TSRD in its mission, GATI has sponsored the publication of study material (books & journals) which will be distributed to schools, colleges and self-help groups so that necessary steps can be taken to preserve the eco-harmony of Sunderban. As a step towards its internal green initiatives, Gati has made it mandatory for all its Express Distribution Centres and Warehouses across the country to plant and maintain a green stretch in and around their premises. Since the last 3 years, Gati has been disposing off its old IT hardware in an organized & environment friendly way. 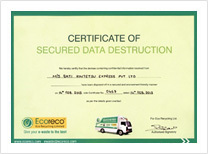 All the old IT hardware is consolidated and handed over to Eco Recycling Limited for recycling. This initiative is aimed at reducing air and water pollution caused by hazardous disposal. Additionally, recycling also reduces the amount of greenhouse gas emissions caused by the manufacturing of new products and helps keep the environment green. 16th July 2010, Gati partnered with the AP Government towards turning the state into ‘Harith Andhra Pradesh’. This first of its kind initiative to plant a million trees on a single day had been taken up by the state government to fulfil the cherished dream of late Chief Minister, Dr. Y.S. Rajasekhara Reddy in turning the state into ‘Harith Andhra Pradesh’, and in turn towards the larger cause of ‘Global Warming’. This drive, envisaged planting a whopping One Million Saplings in just one day across Andhra Pradesh. As part of this historic tree plantation program, Gati provided the complete logistic support needed for organising transportation of the saplings from nurseries to various plantation sites. Gati strongly believes in its responsibility towards the environment. One such initiative undertaken by Gati in the year 2010-11 was the plantation and maintenance of the Green Belt under the Metro Track in Gurgaon, Delhi to offset carbon emissions. As part of this initiative, Gati had planted about 150 tall trees and 300 shorter trees over a stretch of one and a half kilometers to offset carbon dioxide emission. The trees which were planted included Ficus panda (perennial green tree), Bottle Brush (flowering tree), Badelia (ground cover-to prevent evaporation and top soil loss and soil cover for less dust). This would offset approx 1500 to 2500 tonnes of carbon emissions. Towards contributing to Green initiatives, Gati’ites took active participation in the enrichment plantation drive of flower shrubs at the Nehru Zoological Zoo, Hyderabad. This unique plantation was done in the Butterfly Park of the zoo, so that these flower shrubs would attract more butterflies for the nectar. As a contribution towards Green initiatives, 200 saplings were planted across 16 locations in India on 13-Mar-2014, where Gati has its Express Distribution Centers. Some of these included Hyderabad, Bangalore, New Delhi, Mumbai, Chennai to name a few. Its indeed a stupendous moment for GATI by getting associated with Basavatarakam Charitable Trust in providing free plastic surgeries to the most deserving and who cannot afford to pay for the medical bills and surgery. It’s a very unique CSR project and first in the country addressing these type of deformity which is called MICROTIA – ANOTIA. Microtia is a congenital deformity where the pinna (external ear) is underdeveloped. A completely undeveloped pinna is referred to as anotia. Because microtia and anotia have the same origin, it can be referred to as microtia-anotia. Microtia can be unilateral (one side only) or bilateral (affecting both sides). Microtia occurs in 1 out of about 8,000–10,000 births. In unilateral microtia, the right ear is most commonly affected. The deformity can be rectified with a combination of Science & Art i.e. with a help of a Cosmetic Surgeon to re-create a ear & ENT Surgeon to make a hole into the ear so that the child can start hearing. Dr. Mukunda Reddy and his team conduct regular medical camps during which children with this type of deformity are identified and further counselled for the surgery. As on date doctor has successfully completed surgeries for 2 children. There are another 8 children who are going to get operated under this initiative. Gati under its CSR initiative reimburses a fixed amount to the hospital for each patient undergoing this surgery. In simple terms it is totally a free surgery for the patient undergoing this treatment. The ear is re constructed using a Cartilage which is a resilient and smooth elastic tissue, rubber-like padding that covers and protects the ends of long bones at the joints, and is a structural component of the rib cage. Gati has been organizing Refresher training’s programs for their pilots(Drivers), for last one decade through various road safety organizations/Facilitators from OEM(Original Equipment Manufacturer). OEM Training team visits our locations and conduct One day awareness programme on their product, with practical demos by experts. Last year onwards we have started a 2 day in-house training course in an organized manner at our Prabhu Dayal Agarwal Development Centers(PDADC) which are located in Bhorugram, Indore, Pune and Hyderabad. In 2017 around 1287 and 384 pilots in 2018 were trained and we have planned to complete all the existing pilots who are engaged with us, by year end. At the end of two days’ refresher training’s they are rewarded with cash incentive, Certificate of participation and Smart card. This smart card should carried by pilot every time when they drive a vehicle with Gati Cargo. 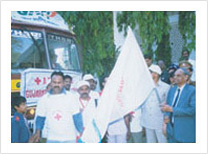 functions, relief and rehabilitation to the people during any natural disasters. It was inaugurated on Sat, 24-Sep-2016 by Shri. Dr. Raghav Langer, I.A.S., District Collector, Rudraprayag and Mr. Manish Agarwal, Executive Director Gati Kausar India Ltd.
Jorhat district and its waters submerged homes and inundated crop fields in about 15 villages located in lowlying areas. Hence we had zeroed in on Gayan Goan village consisting of 100 families to conduct the relief activities. Each family received 10 kgs of rice, woollen blanket, old clothes & notebooks to the children. Why Cut Down trees When they Can Be translocated? 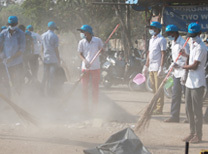 Gati’s unique CSR activity towards environmental sustainability. 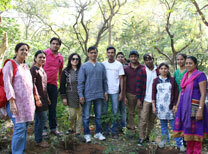 Sustainability program conducts tree plantation drives pan india. A very unique activity of translocation of a huge tamarind tree (Scientific Name : Tamarindus indica) estimated to be around 40 years old was successfully translocated. The Kasturba Gandhi National Memorial Trust (KGNMT) was established in 1945 as a result of a national endeavor, led by Mahatma Gandhi to address the issues of women in rural India. GATI KWE team in association with Share India (MediCIti Institute of Medical Sciences) organized a medical checkup camp for the children of Kasturba Gandhi National Memorial Trust at Mediciti Hospital location at Ghanpur, Medchal Mandal, Ranga Reddy Dist. of Andhra Pradesh. The tests conducted at the hospital included a general checkup (height, weight, BP), ENT, ophthalmology, pediatrics and hemoglobin test. If required and advised by the doctors dermatology and gynecology were conducted. Medicines as prescribed by the doctors were arranged for. A healthy and hygienic sumptuous meal was provided at the hospital. “Thara” is a charitable non-profit organization that takes special interest in the welfare of children who are deprived of a family. GATI-KWE extends its support to this cause by regularly visiting the children at their centres and distributing notebooks and play materials. On 12th Jan 2013, the GATI-KWE team in association with Share India (MediCiti Institute of Medical Sciences) organized for a medical checkup camp for the children at Thara . The tests conducted at the camp included a general checkup (height, weight, BP), dermatology, ear, eye & dental checkup and hemoglobin test. The children were also vaccinated for TT and Hepatitis and given de-worming medicines. Some students who were detected with having medical problems were provided with medicines. Post the completion of the tests, the doctors present in the camp advised the children on the do’s and don’ts for their personal hygiene. The camp concluded by distributing refreshments among the children. On 20th Aug 2013, the GATI-KWE team in association with Share India (MediCIti Institute of Medical Sciences) organized for a medical checkup camp for the children of Thara at Mediciti Hospital location at Ghanpur, Medchal Mandal, Ranga Reddy Dist. of Andhra Pradesh. The tests conducted at the hospital included a general checkup (height, weight, BP), dermatology, ENT, ophthalmology, pediatrics and hemoglobin test. Some students who were detected with having medical problems were provided with medicines and follow-up medical tests. A healthy and hygienic breakfast and sumptuous meal was provided at the hospital. The kids expressed their gratitude when some medical students from the college distributed chocolates. 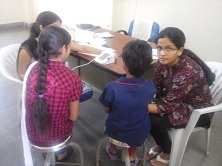 On 22nd Sep 2013, the GATI-KWE team in association with Share India (MediCiti Institute of Medical Sciences) organized for a medical checkup camp for the children at Thara. 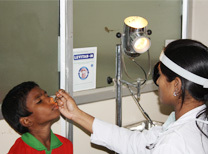 The tests conducted at the camp included ear checkup. The children were also vaccinated for TT and Hepatitis. 11 kids have been advised to visit the hospital for dewaxing in the ear and eye checkup. The camp concluded by providing a vegetables rich meal and fruit. Medicines to Thara Home:Ridding the children of Thara Home from illness, chronic pain, and vitamin deficiencies, as well as fighting malnutrition that amplifies the effects of every illness. To help the most vulnerable, GATI has taken the endeavor and distributed yearlong medicines a way to care for children with items like antibiotics, cough syrups, de-worming medication, vitamin A, and more to help children get healthy and strong. Ridding the children of Thara Shelter Home from vitamin deficiencies as well as fighting malnutrition that amplifies the effects of every illness, Gati has taken up the endeavor and launched the nutrition supplement program effective 1st Dec 2013. In this program all the inmates will be given milk in the morning on a daily basis. GATI KWE Volunteers celebrated Christmas Eve at THARA Shelter home on 24-Dec-2013. A sequence of events followed by a Christmas Eve message, Kids show casing their English speaking skills, dancing to their favorite film songs, gifts & snacks distribution. 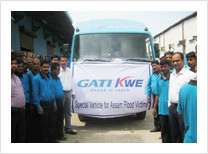 Gati KWE conducts an in-house Clothes Donation Drive across all its locations in India annually. 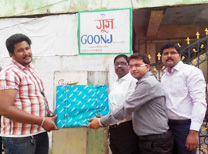 The objective of this drive is to encourage Gati’ities to donate their old clothes to those in need. Gati’ites in large numbers came forward to participate in this initiative. All the clothes collected were handed over to an NGO who in turn gave it to the needy in the rural areas. 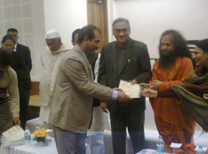 “Daan Utsav (earlier called the Joy of Giving Week) is India’s “festival of giving”! Launched in 2009, the festival is celebrated every year, in the week including Gandhi Jayanthi, i.e., October 2-8, and brings together Indians from all walks of life, to celebrate “giving”. From auto drivers to CEOs, school children to celebrities, homemakers to opinion leaders, millions of people give time, money, resources or skills back to the society by creating or participating in events of their choice. We at GATI decided to donate rice and the collected rice was given to orphanages across India. The initiative saw good response and a total of 5,075 kgs of rice was collected. 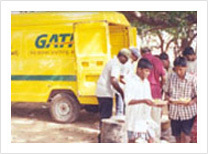 Corporate Social Responsibility has always been at the heart of affairs at GATI. Every year on 17th September, the death anniversary of our founder Late Shri P.D. 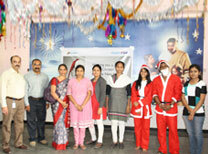 Agarwal, GATI organizes blood donation camps. This year, a large camp was organized at the Gati Head Office, Hyderabad in association with the Red Cross Society of India. 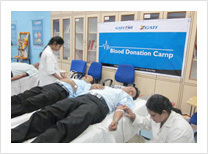 The camp witnessed a large number of employees coming forward to donate blood for this noble cause. The blood collected at this camp would be used mainly for thalassemia children. Gati launched a new initiative “Gati Muskaan” with an aim of not only fulfilling its social responsibility but truly spreading ‘Muskaan’ i.e. happiness and touch lives in the true sense. This one-of-its kind program will focus on all aspects of life, which need attention like education, health, environment and community development. 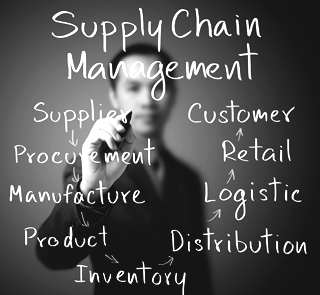 The company realizes that unless all these facets are considered in totality, the efforts to bring about any positive change will be sporadic and outcome not sustainable. No new initiative is complete without divine sanction that can only be brought by children. Gati is highly sensitive to the lesser privileged children of the society, which led the team to conduct a series of activities in orphanages across 17 locations in India. Painting and singing competition along with fun games were conducted and given prizes for best talents which motivated the little ones. A Happy Meal from McDonalds was an icing on the cake, creating moments of joy for each one of them. Gati is also sponsoring an orphanage “Human Development Foundation of Sikkim (HDFS)” where tribal children come from the highly protected area of Zongu. This orphanage was founded by Ms Keepu Lepcha who has been conferred with awards like the �Padma Shri�, �CNN IBM Real Hero Awards and many more, for her selfless work in the development of underprivileged children and outstanding contribution in the field of social service. As part of the 25 years celebrations we identified 25 orphanages across 25 cities in India. Our main aim to spread spread smiles was achieved by engaging in some fun activities like games, painting and singing competition. Prizes were given away to best talents. We also made a donation towards these orphanages by providing them with winter provisions, utensils, washing machine and refrigerator. The 25th year of Gati was celebrated with great zeal and enthusiasm across 25 cities. The June 2013, cloudburst centered in the state of Uttarakhand caused devastating floods and landslides. Many people perished, lots more went missing and many villages were completely washed off. 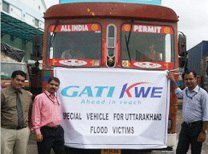 As a small support to the relief operations being carried out by Oxfam, GATI-KWE Team dedicated vehicles to carry relief materials to the flood affected areas. In addition to this, dedicated warehouse space was also offered for storage of relief materials which had to be transported to the affected areas. The 67th Independence Day was celebrated with much fanfare by weavers under the care of P.D. Agarwal Foundation Rajoli Weavers Shed on 15-Aug-2014. The event started off by paying tributes to the father of the nation by Dr. P.S. Reddy and the MLA hoisting the national flag. All the people assembled sang the national anthem in unison by saluting the national flag. The tsunami that struck South East Asia on December 2004 was one of nature’s worst disasters ever. It left in its wake more than 10 lakhs people dead and over four million displaced. The tsunami relief operations have been hailed as one of the fastest and most massive operations ever. Gati was one of the first to reach the rescue scenes at Nagapattnam and Cuddalore. Gati brought in food, water, clothing, medication and a team of doctors. The team took special care of children, who were the most affected and also provided the community with essential utensils like plates, glasses etc. On 26 January 2001, Gujarat was hit by a massive earthquake. Bhuj district is the worst affected. Gati personnel sprang into action and reached Maye village on the same day to provide food, clothing, medication and water to the earthquake-affected community. A team of doctors were also brought in to provide medical aid to the 400 families in Maye. Gati was the first to build makeshift houses for these families -(houses that were scientifically designed to resist earthquakes). Even today, though the villagers have managed to rebuild their homes, they still retain these structures. Donation to Medical Research Project to improve rural health.